Keep up to date with upcoming events on our Meetup page. We plan to pick apples from Alan’s heritage mini-orchard on the Weald allotment site, giving most of them to Fareshare, taking some home to sample, and juicing many of the ‘not quite perfect apples’ to make our own delicious drink. It will be a real treat. We will also share Viv’s recipe for apple chutney and show you the ingredients so that you can make delicious chutney in your own kitchen and have it with cheese/ fake cheese on toast. Bring your own organic apples if you have any to share; a press will be available on the day. BHOGG members only event or join on the day. Saturday 15th September, 2pm-4pm: Urban Gardening Course –Seed Saving at the Phoenix Community Centre. Our seed saving session this autumn will cover the basics of simple flower & vegetable seed collection, care & storage (including tomatoes). Free to paid up BHOGG members and local Phoenix area residents, £3 donation for non-members. Geoff Mead will reveal to us the history of gardening & food production in Brighton as we take a leisurely stroll from the Palace Pier around the city. Please wear suitable shoes/ clothing, remembering to bring water, hat, sun cream, waterproofs, etc as the weather dictates for this outdoor event. Meet at Palace Pier, July 18, 7pm. Free to BHOGG members; £10/£5 non-members or join on the night. We shall hopefully begin to harvest plus doing summer pruning of the apple and pear cordons (yes we know it’s a bit early!). NB: we have cancelled the August session, but will have an informal harvesting and maintenance workshop at some point in August; contact Ruth nearer the time. Free to BHOGG members and local Phoenix area residents, £3 donation for non-members. Free for BHOGG members and local Phoenix area residents, £3 donation for non-members. Spring in the Air: Sowing and Growing Talk with Ruth Urbanowicz. Thursday 19th April, 7.30-9pm at Phoenix Community Centre. Ruth will share the ABC’s of easy veg growing in gardens, plots or containers and explain how to give our veg the best growing conditions possible. This will include: what they need, how to protect them from pests & diseases, crop rotation, composting, companions and soil care. Following on from Ruth’s seed sowing session in March, attendees will learn how to prick out and pot on. Everyone will be able to take home a tomato seedling! Seaweed meal and potassium will also be available to buy. Free to BHOGG members and local residents; £3 to non-members (or join for £10/£5). We are planning to do some communal gardening first of all from 11 am and then to share some food together by 12- 30, giving us a chance to socialise and get to know each other. Spring is one of the busiest times of the year anticipating the season ahead so we will need to do some serious gardening first. For the picnic we hope to bring along something hot ( eg past or soup) for all to share, but please bring along something for yourself and others to share. We have more than enough plates, cutlery, mugs etc. though you may want to bring a hot flask as there are only two gas rings. Joshua the gardener was very popular at Seedy Sunday, with a huge line of people waiting to ask him questions after his talk. We are delighted to have him come talk to us at the Phoenix Community centre in a few weeks. His talk is based around growing vegetables without the need to cultivate the soil so, no digging, forking or tilling. The no dig gardening method was made popular by Charles Dowding and having featured on gardeners world a few weeks back it is going through a rapid rise in popularity. It’s a process of adding organic matter in layers and growing almost immediately. Healthier plants, healthier soil and bigger yields. The talk covers all aspects of how to get started, sowing and harvesting as well as design points. The talk currently is around 60 minutes with plenty of time for Q&A at the end. NOTE CHANGE OF DATE: Thursday 22nd February, 7.30pm at the Phoenix Community Centre. Ever wondered what to do about a glut of fruit or vegetables from your plot? Are you concerned about the growing problem of food waste while people still go hungry? FareShare Sussex is a Brighton-based charity working across the county to connect food that would normally go to waste with the people that need it. Learn more about how FareShare works, and find out ways you can help to reduce food waste while helping provide healthy food to those who need it. Our speaker Kate Harrison is a BHOGG member and has gardened on the Weald allotment for 17 years. She is a member of the FareShare Sussex steering committee and is passionate about reducing food waste and helping more people eat healthy and nutritious food. At BHASVIC Brighton and Hove Sixth Form College. Come along to hear BHOGG’s very own resident RHS qualified teacher talk about pests and diseases. £3 donation, free to local residents and Bhogg memebers. Come along to hear BHOGG’s very own resident RHS qualified teacher talk about getting back to the basics. Ruth Urbanowicz will explain the importance of the What? Why? and How? of gardening organically, and look at the history, context, and putting it into practice. 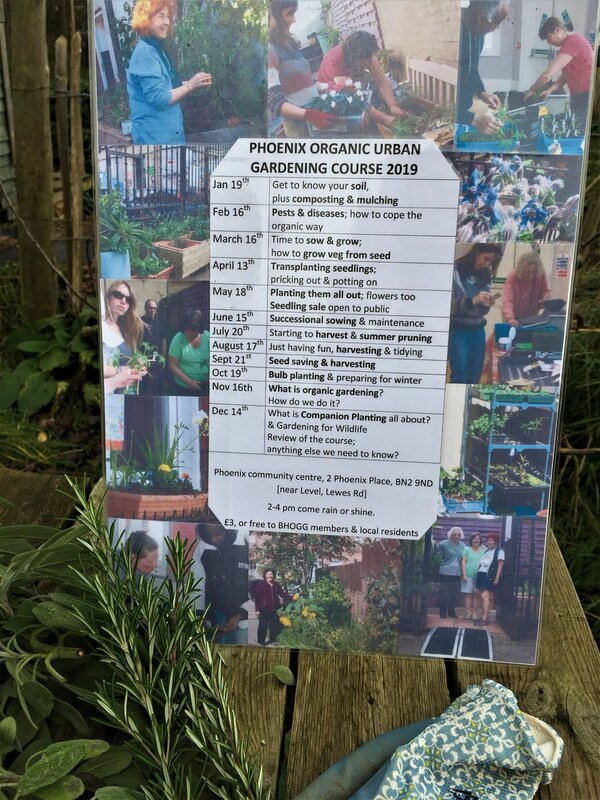 As part of the Urban Organic Gardening Course which runs weekly at the Phoenix Community Centre, Ruth Urbanowicz, qualified RHS gardening teacher, will be giving a talk all about soil. Dr. Beth Nicholls of the University of Sussex will talk about pollinators and pesticide exposure, working with domestic growers, and provide an update on this year’s Team Pollinate citizen science project. We will wander with Vera in the woods. She will show us which fungi are ok to pick, and which are not, whether they are poisonous or whether they are part of a fragile ecological web needing to be conserved not disturbed. Come explore a popular Brighton park and discover a variety of edible wild plants, including their traditional uses, identification tricks and other interesting plant facts. Bring a notepad, your own lunch and be ready for a little hike! Meet one of the UK’s pond experts; kids welcome; find new bugs you have never seen before. We’ll look at the new Food Partnership project too. Take a walk with the creator of this fabulous school grounds to learn how easy permaculture is to do. 11 – noon – followed by a picnic – new members welcome to join on the day.